Joseph Bates was a co-founder of the Seventh-day Adventist Church along with James and Ellen White. 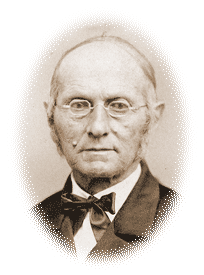 Perhaps there was no more unlikely Seventh-day Adventist preacher than Joseph Bates. When he was young his family moved from Rochester, Massachusetts, to the port city of Fairhaven, Massachusetts, where he became fascinated with the sea. He set out from Fairhaven at the age of 15 as a cabin boy. He experienced shipwreck, capture, and forced service in the British Navy, and for two-and-a-half years was a prisoner of war in England, being released in 1815. Bates eventually served as captain of his own ship, beginning in 1820. In 1821 he gave up smoking and chewing tobacco as well as the use of profane language. He later quit using tea and coffee and in 1843 became a vegetarian. Bates retired from the sea in 1827 with $11,000, a small fortune for the time. Converted during his years at sea, after his retirement at age 35 Bates became associated with several reforms, including temperance and antislavery. In 1839 he accepted the second advent preaching of William Miller and became an active, successful Millerite preacher. He eventually invested all of his money in the advent movement.